September 2017 DNASTAR Newsletter – Lasergene 15 is coming soon! Home Newsletters September 2017 DNASTAR Newsletter – Lasergene 15 is coming soon! Lasergene 15 is coming soon! 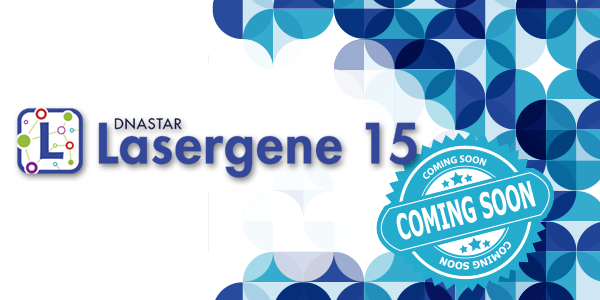 In the next several weeks, we will be announcing the release of Lasergene 15, a major upgrade to the DNASTAR Lasergene Suite. This release is very exciting for us, in part because it includes a complete overhaul of SeqBuilder, the foundation of our Molecular Biology Suite. In fact, the revamp was major enough that we felt it needed a new name — SeqBuilder Pro. Enjoy all of the functionality you know and love, but with a more intuitive and streamlined design. Join Matt Keyser on October 11 at 12:00 pm EDT for a 30-minute webinar to walk you through our new SeqBuilder Pro application. 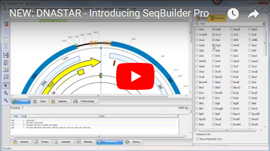 In addition to a new state-of-the-art look and feel, we’ve also improved upon many of the SeqBuilder functions you rely on for sequence editing, map creation, and primer design. Join us to learn more! Get a Sneak Peek at SeqBuilder Pro! In Lasergene 15, SeqBuilder has morphed into a much more intuitive and streamlined application we’re calling SeqBuilder Pro. Don’t worry, all of the functionality you know and love is still there: sequence map creation, primer design, virtual cloning, and all the rest, but it’s easier and more intuitive to use! Watch our new overview video to get a sneak peek.